Eve Dallas Returns to Face Her Most Ingenious Foe - a "Secret Admirer" Who Taunts Her With Letters . . . And Kills Without Mercy An unknown bomber is stalking New York City. He is sending Eve Dallas taunting letters promising to wreak mass terror and destruction among the "corrupt masses." And when his cruel web of deceit and destruction threatens those she cares for most, Eve fights back. It's her city . . .it's her job . . . and it's hitting too close to home. Now, in a race against a ticking clock, Eve must make the pieces fit - before the city falls. 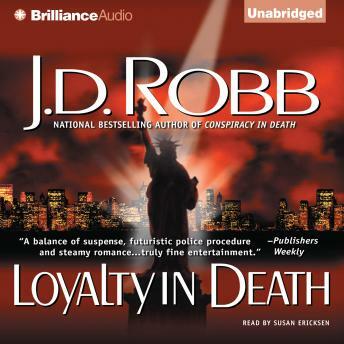 One of J D Robb's best. I have read, listened to and reread most of them. The suspense builds gradually and it's difficult to put down. Simply audiobooks should offer every single one of them. Always enjoyable to settle in with a JD Robb (Nora Roberts) book and this one was no exception. Always a joy to see what Eve Dallas is up to and how she goes about solving a crime and getting a peak into her complex personality. I am really enjoying getting to know her better. Another great story by J.D. Robb. This one was a bit different than the other books as it dealt with a group that wanted to over throw the government. The reader is great. I am glad they have kept the same reader for all the books. This story introduced us to Peabody's brother. You will enjoy this fast pace book.